Are you an English student struggling to understand student finance? You can get money towards your tuition fees – now capped at £9,250 a year for UK and EU students - and for your living costs. Note, the below refers to English students studying in England for the 2019/20 academic year (unless otherwise stated). If you’re not from England, check our guides to see how student finance works if you're from Scotland, Wales and Northern Ireland. In England, tuition fees are capped at £9,250 a year for UK and EU students. The good news is that you can apply for a combination of student loans to cover these tuition fees, as well as going towards your living costs. There's a variety of sources of extra funding too, for topping these up (but you'll need to do a little digging to seek these out yourself). Plus, you only start repaying the loan once you’ve graduated and you’re earning above a certain threshold. How much will my tuition fees be? Students in England will pay a maximum of £9,250 per year in tuition fees. See what your tuition fees cover (and what they won't). The cap on how much universities can charge has been raised from £9,250 for those offering a certain high standard of teaching. For all other universities, the cap remains at £9,000. Read more about these recent changes to maximum fees. How much are tuition fees in the UK? 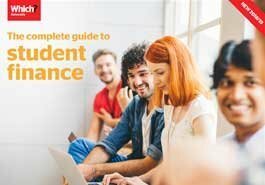 What student finance can I get (and how much)? If you have any queries about the above eligibility criteria, check the GOV.UK website for more information. You don’t need to find the money to pay your tuition fees upfront. You can apply for a Tuition Fee Loan to cover these, and you'll only begin paying this back once you’ve graduated and you're earning over a certain amount. These go straight to your university, so you'll never see the money and you don't really need to worry about them too much. While it might seem like a lot of money now, don’t just look at the price when choosing a course – find the course that’s right for you! Because of the way you’ll repay your loan, a course with lower tuition fees doesn’t always work out cheaper. This part of your student loan is designed to cover the cost of accommodation, utility bills, course materials and other living costs. Like your Tuition Fee Loan, you’ll only start repaying this once you're earning above a certain amount per year after graduating. How much you’ll get in maintenance support will depend on where you'll live and study, as well as your household income; the less this is, the more loan you're entitled to. For example, if your annual household income is £25,000 or less and you're living away from home outside London, you'd be eligible to receive the maximum amount of £8,944. You’ll apply for both your Tuition Fee Loan and Maintenance Loan in one go, via the Student Finance England website. As a guide, the recommended application deadline is the end of May for receiving student finance by the start of the university term, based on what we know from last year. You can apply after this date, but it's not guaranteed that you'll receive the funds in time for September. You can apply for student finance up to nine months after the beginning of your course. There are also extra funding options that you don’t have to repay. Bursaries and scholarships are offered by universities, organisations, companies and charities for a variety of reasons, from academic ability to participation in certain extracurricular activities. They can help towards tuition fees, course costs and living costs, so make sure you enquire about these. The application process will vary from provider to provider. What extra funding is there? Do you have children or dependent adults? Childcare Grant: To help with childcare costs for full-time students, these are worth up to £164.70 per week if you have one child or £282.36 per week (based on the 2018/19 academic year) if you have two or more. Learn more on Gov.uk. Parents’ Learning Allowance: Worth up to £1,669 a year (based on the 2018/19 academic year), if you have children you can apply for this to help with costs tied to your education and course such as books and travel. This depends on household income. It won't affect your benefits or tax credit either. Learn more on Gov.uk. Adult Dependants’ Grant: If you have an adult who depends on you financially, you can apply for this grant worth up to £2,925 (based on the 2018/19 academic year). Learn more on Gov.uk. Child Tax Credit: If you have three or more children under 17 (or under 20 and in approved education or training), you can receive financial support for each qualifying child. If your child is 16, you can claim up until 31 August after they turn 16. Learn more on GOV.UK. Disabled Students’ Allowances are available if you have a disability that meets the Equality Act 2010’s definition, such as a long-term health or mental health condition or learning difficulty. What support you receive will depend on your disability. If you’re studying a medical, dentistry or healthcare course, you might be eligible for an NHS bursary to help with course or living costs. There are also bursaries for social work students and extra help for teacher training students. Hardship Funds are available if you run into financial difficulties while at university. They should be a last resort once you've tried all other sources of funding or financial help. You can apply directly to your university or college for assistance. How much you can receive will vary from one institution to the next as this is not funded by government. You'll also need to provide evidence of your outgoings to show how you've spent your money eg bank statements. How is my student loan paid back? Note, the information below on repayments refers to those who fall under Plan 2 (English and Welsh students who started studying after 1 September 2012). You could come out of a three-year university course with up to £50,025 (plus interest) to pay back in student loans, although most will have a lower level of debt. However, you'll only start paying back your student loan once you are earning above the annual threshold. This is £25,725 (as of 6 April 2019, having gone up slightly from £25,000). If your salary drops below this threshold at any point, your loan repayments will stop until you're above this again. Once you are earning this or more, you'll pay back 9% of your income that's above the threshold. This means it doesn't matter how much you borrowed, but rather how much you're earning. divide by 12 to see how much you'll pay back roughly per month. After 30 years, any outstanding debt you still owe will be written off, even if you didn’t pay anything during some of that time (because you weren’t working or you were earning below the repayment threshold). A major review into university funding in 2010 estimated that around 60% of graduates won’t have paid their full loan back after 30 years. Keep in mind that the interest rate changes every year, so keep your eyes on the news for the new one. Remember, you won’t pay anything until you earn the repayment threshold or more – but the interest will be ticking over in the background. Check the Student Loans Company website for more information about your repayments. What parents should know about student finance.